This recipe was a mistake! 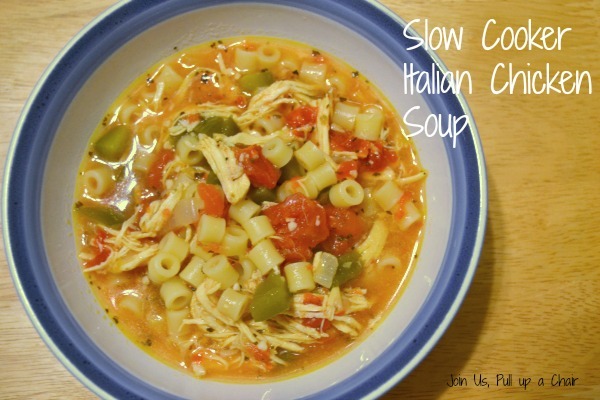 I had planned to make a slow cooker chicken parmesan soup, but after looking at the recipe, I was missing some ingredients…so I winged it and came out with this delicious soup instead! Sometimes mistakes turn into something really good. Since I work from home the majority of the time, I have flexibility to throw dinner in the slow cooker on my lunch break and can cook it on high and it’s ready by dinner. Everyone loved the soup, no complaints from the kids and it was great for leftovers too! In the slow cooker, combine the garlic, green pepper, can of tomatoes, onions, chicken stock, chicken breasts, and seasonings. Cook on low for 7 hours or high for 3 1/2 hours. Once cooked, removed the chicken breasts and shred. Return to the slow cooker and add in the uncooked pasta. Increase the heat to high and cook for an additional 30 minutes or longer until the pasta is completely cooked. Add more stock if necessary. Serve and garnish with fresh basil or parsley.